When it comes to maximizing your workout time, nothing is more effective than circuit training. By performing a full body workout with little rest in between exercises you torch major calories while toning and strengthening your muscles, all at the same time. You can also design a phenomenal circuit without utilizing any equipment. This means that you can do it anytime, anywhere. In the privacy of your own home, outside, in your hotel room while traveling — all you need is your bodyweight and a small area to move around in. Another great component of circuit training is that you can design it so that you do the exercises by time instead of by the number of repetitions. This means that the circuit scales itself and is just as effective regardless of whether you are just starting an exercise program or have been working out for years. You do what you are capable of doing in the time interval allotted, maintaining an intensity and performing the number of repetitions that challenges you. 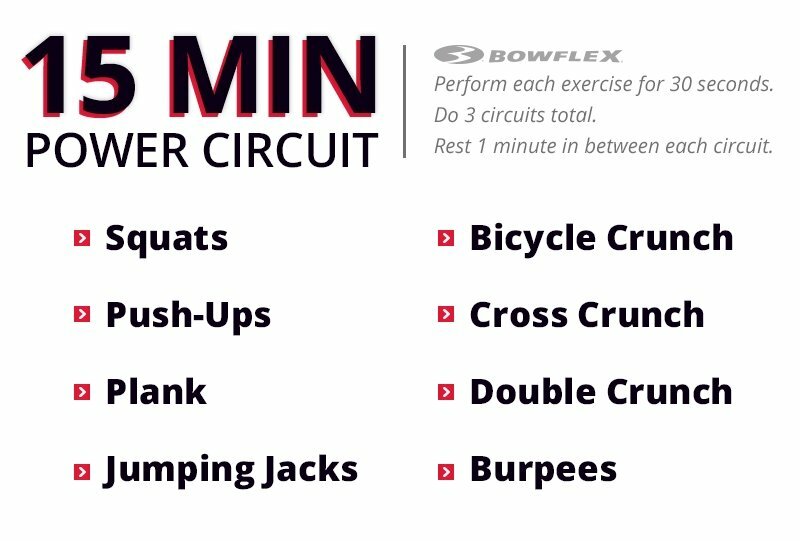 So here you have it — The 15-Minute Power Circuit. Perform each exercise for 30 seconds, doing three circuits total, taking one minute of rest in between circuits.